We are always looking for female singers of all ages and voice ranges to join us on the risers. You can start the proces by visiting us at a regular rehearsal or one of our Guest Nights! Our New Member Coordinator will greet you and get you settled. You'll be able to see first-hand what it means to be a singer with the Greater Richmond Chorus. Then, we'll help you prepare for your audition! Our Music Team will help find a vocal part that fits your voice range and the Membership Coordinator and Section Leader will guide you through the process. Membership auditions are held year-round and our rehearsals are always open to prospective members. We rehearse every Monday night from 7:00-10:00 at our spacious rehearsal hall at Branch's Baptist Church in Richmond, VA. 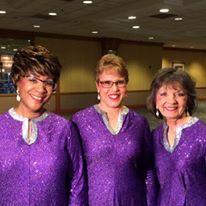 The Greater Richmond Chorus is a membership-driven organization that requires monthly dues. These dues provide tremendous benefits to you at the local, regional, and international levels! Some of these include voice training, musical education, annual competitions and conventions, regional leadership and music school events, coaching by championship-level choral coaches, annual retreats, and so much more! And, in addition to all the musical benefits, you'll develop life-long friendships with your fellow singing-sisters! If you love to sing and perform, then join the fun, the music, and the friendship - Join Greater Richmond Chorus!